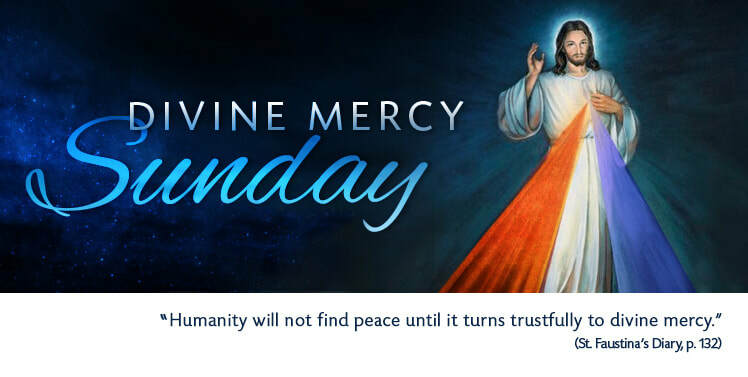 What is Divine Mercy Sunday, the first Sunday after Easter, and Why should I Participate? First Day: Today bring to Me ALL MANKIND, ESPECIALLY ALL SINNERS, and immerse them in the ocean of My mercy. In this way you will console Me in the bitter grief into which the loss of souls plunges Me. Second Day: Today bring to Me THE SOULS OF PRIESTS AND RELIGIOUS, and immerse them in My unfathomable mercy. It was they who gave Me strength to endure My bitter Passion. Through them as through channels My mercy flows out upon mankind. Third Day: Today bring to Me ALL DEVOUT AND FAITHFUL SOULS, and immerse then in the ocean of My mercy. The souls brought Me consolation on the Way of the Cross. They were that drop of consolation in the midst of an ocean of bitterness. Fourth Day: Today bring to Me THOSE WHO DO NOT BELIEVE IN GOD AND THOSE WHO DO NOT YET KNOW ME. I was thinking also of them during My bitter Passion, and their future zeal comforted My Heart. Immerse them in the ocean of My mercy. Fifth Day: Today bring to Me THE SOULS OF THOSE WHO HAVE SEPARATED THEMSELVES FROM MY CHURCH, and immerse them in the ocean of My mercy. During My bitter Passion they tore at My Body and Heart, that is, My Church. As they return to unity with the Church, My wounds heal and in this way they alleviate My Passion. Sixth Day: Today bring to Me THE MEEK AND HUMBLE SOULS AND THE SOULS OF LITTLE CHILDREN, and immerse them in My mercy. These souls most closely resemble My Heart. They strengthened Me during My bitter agony. I saw them as earthly Angels, who will keep vigil at My altars. I pour out upon them whole torrents of grace. Only the humble soul is capable of receiving My grace. I favor humble souls with My confidence. Seventh Day: Today bring to Me THE SOULS WHO ESPECIALLY VENERATE AND GLORIFY MY MERCY, and immerse them in My mercy. These souls sorrowed most over my Passion and entered most deeply into My spirit. They are living images of My Compassionate Heart. These souls will shine with a special brightness in the next life. Not one of them will go into the fire of hell. I shall particularly defend each one of them at the hour of death. Eighth Day: Today bring to Me THE SOULS WHO ARE DETAINED IN PURGATORY, and immerse them in the abyss of My mercy. Let the torrents of My Blood cool down their scorching flames. All these souls are greatly loved by Me. They are making retribution to My justice. It is in your power to bring them relief. Draw all the indulgences from the treasury of My Church and offer them on their behalf. Oh, if you only knew the torments they suffer, you would continually offer for them the alms of the spirit and pay off their debt to My justice. Ninth Day: Today bring to Me SOULS WHO HAVE BECOME LUKEWARM, and immerse them in the abyss of My mercy. These souls wound My Heart most painfully. My soul suffered the most dreadful loathing in the Garden of Olives because of lukewarm souls. They were the reason I cried out: 'Father, take this cup away from Me, if it be Your will.' For them, the last hope of salvation is to run to My mercy.